As I prepared to fry a few potatoes for breakfast this morning, I poured just a bit of oil in the fry pan. 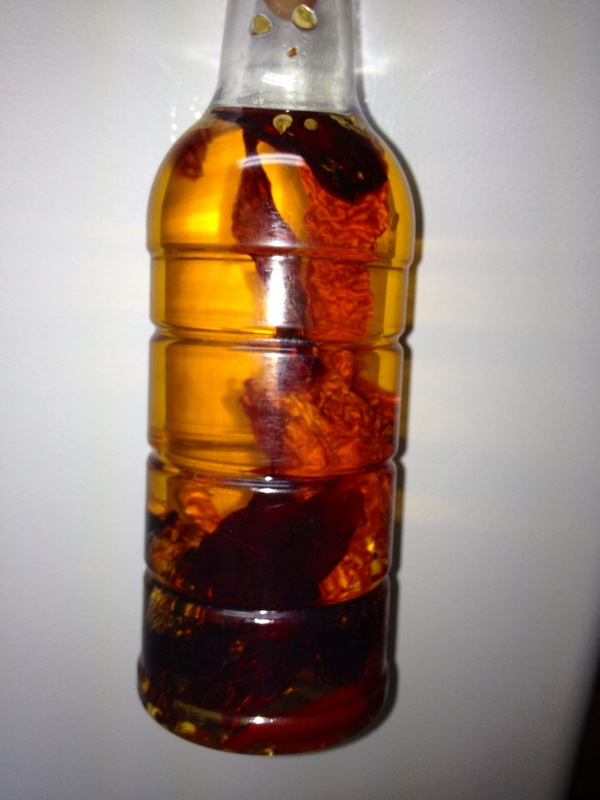 A quick review will remind you that (just 3 weeks ago) I added several of my home grown/sun dried Cayenne and Jalapeño peppers to a fresh dispenser of peanut oil. What caught my eye this morning was that the oil no longer had its transparent clarity. What I did see was a deep red hue! Did I notice a flavor difference? No, not really. Both my tongue and lips went numb and l lost most of the feeling in my mouth. Gradually, as my sinuses (along with my tear ducts) reached a 100% level of activity, I realized I had created one of my new favorite food groups! My, Oh My! I think I’ll try it with pancakes in the morning.